GINA, Glowbeans' flagship product is probably the smartest coffee brewer you have ever seen. 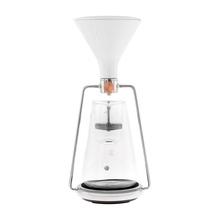 This seemingly simple dripper offers three brewing methods, has a built-in scale, connects to other devices with Bluetooth technology, and is absolutely well-designed - no wonder the project was backed by thousands of supporters on Kickstarter. Meet Gina!